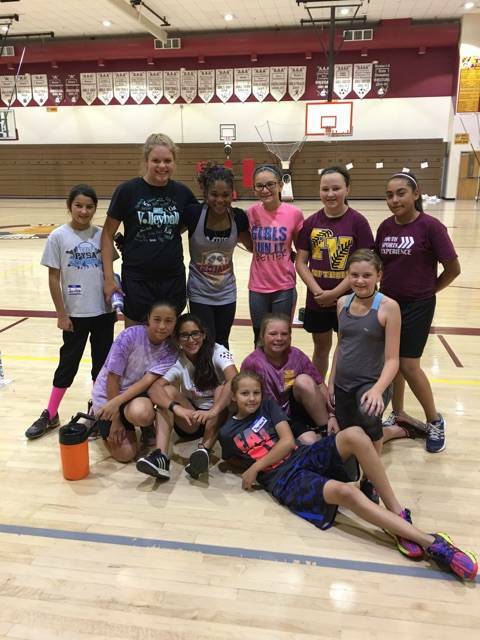 In the continuing effort to keep kids and their parents informed about upcoming sports clinics in Pahrump, Dominique Maloy returns to the area for a “Back2School – A Youth Sports Experience” clinic. Special to the Pahrump Valley Times Dominique Maloy is putting on a back-to-school sports clinic from July 21-24 at the Pahrump Valley High School gym. Maloy teaches all athletes and works on everything from getting faster to just being a better athlete. Above, she poses with the “The Dirty Squad” softball team coached by Sam Charles. 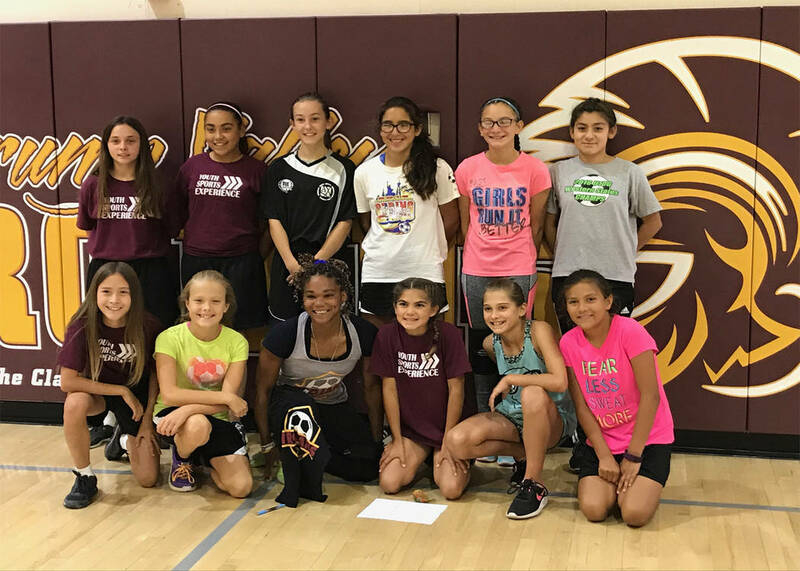 Special to the Pahrump Valley Times The Pahrump 05 Trojans soccer team, coached by Danny Coleman, took some time to go to one of Dominique Maloy’s clinics. Special to the Pahrump Valley Times Dominique Maloy was a powerhouse athlete for the Trojans basketball and track team. While with the Trojans, she was a 15-time track state champion and then was an All-American athlete for Arizona State. She is pictured catching a football and she plays for the Legends Football League’s Seattle Mist, where she is a wide receiver and defensive back. Special to the Pahrump Valley Times Dominique Maloy was a powerhouse athlete for the Trojans basketball and track team She was 15-time track state champion and an All-American athlete for Arizona State. 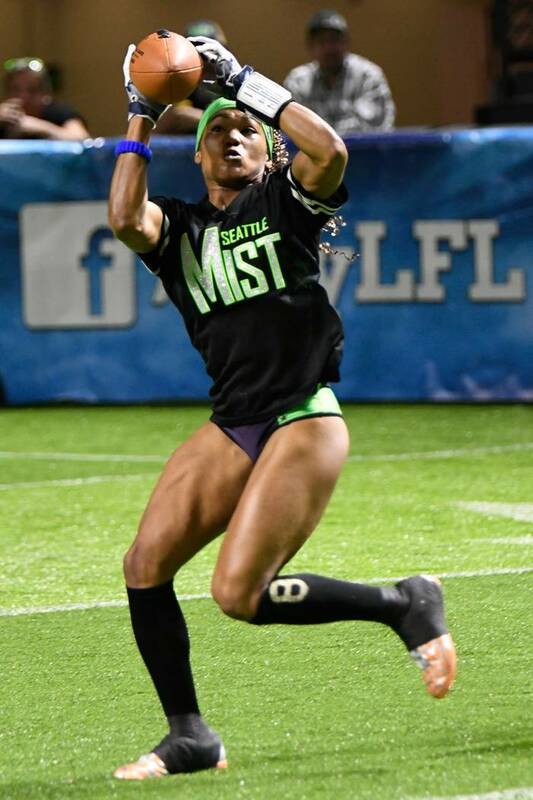 She is pictured catching a football and she plays for the Legends Football League's, Seattle Mist where she is a wide receiver and defensive back. The clinc will be held at the Pahrump Valley High School gym from July 21-24. The price for participants will be $20 for four days or $10 per day. The times are 9:30 a.m. – 10:30 a.m. (seventh to 12th grade-athletes), and 11 a.m. – noon (third to seventh grade-athletes). According to Maloy, her clinic will focus on the following fundamentals: coordination, balance, technique and standards. She said she will address skills such as speed, agility, strength, mental toughness and endurance and she enjoys working with young athletes. While at Pahrump Valley High School, Maloy was a three-sport athlete, lettering four times in track and basketball and twice in soccer. She was the track team captain as a senior and team captain in her junior and senior years in basketball. In track, Maloy was a 15-time state champion. She graduated from Arizona State University, where she was a six-time All-American, while accumulating some of the fastest times in the school’s history. She ran both indoors and outdoors; some of her personal best times at the outdoor level included 11.39 seconds in the 100 meter, 23.28 seconds in the 200 meter and a time of 52.69 in the 40 meter. She also has earned bronze and silver medals at the 4×400-meter relay run. The All-American was also an Academic All-Pac-10 Honorable Mention selection. For the clinic, there are 10 sponsored spots available to families/athletes not financially able (show up or contact her directly). To sign up for the clinic, email youthsportslv@yahoo.com or show up at the designated time.